Choi Eun Seol (Shin Se Kyung) arrives home to find her parents murdered. When the murderer is distracted, she escapes but is hit by a car. Eun Seol's parents are later found with a barcode carved into their skin, the work of the "Barcode" serial killer. On that same night, Choi Mu Gak (Park Yoo-chun) is at the hospital visiting his younger sister, also named Choi Eun Seol (Kim So Hyun), who's being treated for mild injuries after a bus accident. When he returns to her bed, he finds her dead with her throat slit. Six months later, Eun Seol comes out of her coma. She has no memories at all of her life before waking up at the hospital, and her left eye has turned green with no scientific explanation. She has also gained the unique ability to "see" smells as visible colors and shapes. On the other hand, Mu Gak had been so traumatized by his sister's death he'd lost the sense of smell and taste, and is unable to feel pain. Unlike his previous warm personality, Mu Gak is now stoic, emotionless, and speaks in a monotone way. How will fate bring these two senseless people together? I’m sorry about the weird plot description, but it was really hard to describe the drama without spoiling anything. Moreover, I felt like I had to justify the title of the drama somehow. When I first heard about it, I thought it was a strange title, I never imagined that it was literally about seeing smells. I was really looking forward to how they would manage to visualize smells and odor. It wasn’t how I imagined it (I don’t know what I expected haha), but somehow they did a good job with it, can’t complain. The biggest issue about the drama is in the plot; the pacing. In the first half of the drama, the pacing is fast. Things happen every episode and the plot moves quickly. Then around the halfway point, the writing loses steam. I think it’s a shame. The story had a lot of potential, so I don’t know how they managed to push it over a cliff. Don’t get me wrong, I just feel disappointed with the latter half of the drama since it had such a good start. One thing though that made me uncomfortable, was the image of ‘the national police force’. Did they have to make them so stupid and incompetent, that they actually needed a girl who sees smells to solve crimes? The actors were all okay, although I have to point out I’m not a fan of Shin Se Kyung, and her performance didn’t really impress me. Nam Goong Min was the best though! Okay first of all the title of the drama is so ridiculous “The Girl Who Sees Smells”, which by the way I get, but it kind of doesn’t revolve around her only. Yes I get the entire serial killer story, which by the way has probably the world’s creepiest and handsomest serial murderer ever, but I don’t get why it’s her name at the title. Or yeah, not her name, but it is not a drama about a girl seeing smells, it’s about a girl who sees smells, a boy without emotion/senses and a serial killer barcoding his victims, and a whole lot of mix and match between everyone. But yeah, you get the point. Also the story could have been more interesting if they all were normal, but I guess she has to see smells in order to be interesting. Anyway, I don’t like her (Shin Se Kyung) never did, and this drama actually made her seem decent, but I still don’t like her. 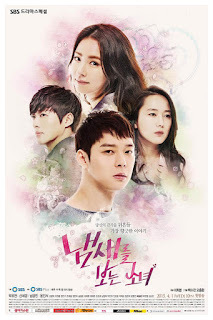 Yoo Chun was great, I still am a fan of his - I mean a lot of his dramas are still circling my mind this day today. Okay, no more complaining. The drama is good and a must watch for crime fans, also if you like any of the actors you won’t be disappointed while watching.